Marriage is an important milestone in securing long-term financial stability. On average, entering marriage improves a man’s wages by 27 percent.1) According to Dr. Brad Wilcox of the University of Virginia and Dr. Wendy Wang, 97 percent of young adults who follow the “success sequence”—obtain at least a high school degree, get a job, marry, and have children, in that order—avoid poverty.2) The success sequence holds true for racial/ ethnic minorities, and for those from low-income families.3) Promoting marriage is an efficacious means of improving the financial security of American families. Our own analysis of the Federal Reserve Board’s Survey of Consumer Finance (2007) shows a similar trend but with a more detailed break-out of wealth by family type. This is summarized in in the chart below. Asset accumulation also occurs at much higher rates in married, intact families. 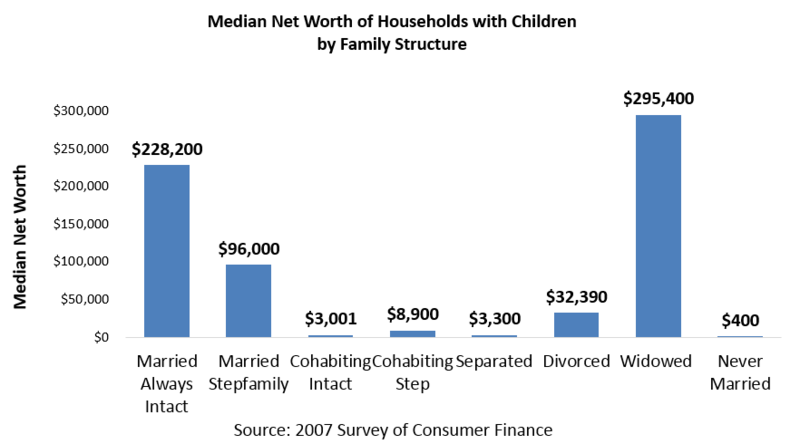 Married households enjoyed net worth growth $3,000-17,000 higher (over two years) than did other family structures, according to 1992-2006 data.23) In 2000, the median net worth of families with children under 18 was highest in always-intact families ($120,000) and second highest in stepfamilies ($105,360). But after stepfamilies, the net worth of other family structures experiences a massive drop-off. At the bottom of the heap are never-married parents, who had a median net worth of $350. This “never-married” category is composed almost exclusively of single mothers, who overwhelmingly have paltry assets in terms of real estate, savings, or automobiles.24) That married-parent families are more likely to have received an inheritance, own a business, nonresidential real estate, a vacation home, and savings bonds—and carry less debt relative to their assets—helps to explain why they stand apart from all other family types. Their heightened capacity to accumulate wealth, therefore, enables married-parent families not only to invest in retirement accounts and pass on greater wealth to their children but also provide needed capital to fuel economic expansion. To the degree that Americans marry less, and have fewer children, less savings are correspondingly available for capital markets. Poverty27) is principally the problem of non-intact family structures. Compared to married families, six times as many female-headed families are impoverished. There are differences in the financial well-being of always-single mothers and divorced mothers, but poverty and welfare needs are major problems for female-headed households. Only 5.8 percent of married families were living in poverty in 2009, compared to 16.9 percent of male householders and 29.9 percent of female householders.28) Additionally, intact families are less likely than cohabiting families or single individuals to have ever participated in the Food Stamp Program 29) (now SNAP, the Supplemental Nutrition Assistance Program). 1) Antonovics, Kate, and Robert Town, “Are All the Good Men Married? Uncovering the Sources of the Marital Wage Premium,” The American Economic Review 94, no. 2 (2004): 317-321. 2) , 3) Wang, Wendy and W. Bradford Wilcox, “The Millennial Success Sequence: Marriage, Kids, and the 'Success Sequence' among Young Adults”, American Enterprise Institute and Institute of Family Studies (June 2017), available at http://www.aei.org/wp-content/uploads/2017/06/IFS-MillennialSuccessSequence-Final.pdf. 4) Joseph Lupton and James P. Smith, “Marriage, Assets, and Savings,” Labor and Population Program, Working Paper Series 99-12 (November 1999): 16-17. 5) Federal Reserve Bulletin, “Changes in U.S. Family Finances from 2004 to 2007: Evidence from the Survey of Consumer Finances,” (February 2009): A5. 6) , 24) Survey of Consumer Finance, 2001 data. 7) U.S. Census Bureau, Statistical Abstract of the United States (2009): Table 676. 8) Scott A. Hodge, “Married Couples File Less Than Half of All Tax Returns, But Pay 74 percent of All Income Taxes,” Tax Foundation Fiscal Fact no. 4, March 25, 2003. Sarah Avellar and Pamela J. Smock, “The Economic Consequences of the Dissolution of Cohabiting Unions,” Journal of Marriage and Family 67, no. 2 (May 2005): 315-327. As cited by The Heritage Foundation: Family Facts. Available at http://www.familyfacts.org/briefs/31/family-structure-and-economic-well-being. Accessed 20 July 2011. 10) Phillip Cohen, “Cohabitation and the Declining Marriage Premium for Men,” Work and Occupations 29, no. 3 (2002): 354. 11) George A. Akerlof, “Men Without Children,” The Economic Journal 108, (1998): 287-309. As cited in Pat Fagan, Henry Potrykus, and Rob Schwarzwalder, “Our Fiscal Crisis: We Cannot Tax, Spend and Borrow Enough to Substitute for Marriage,” (June 2011). Available at http://marri.us/research/research-papers/our-fiscal-crisis/. Robert F. Schoeni, “Marital Status and Earnings in Developed Countries,” Journal of Population Economics 8, no. 4 (November 1995): 357. All as cited in Patrick F. Fagan, Andrew J. Kidd, and Henry Potrykus, “Marriage and Economic Well-Being: The Economy of the Family Rises or Falls with Marriage,” (May 2011). Available at http://marri.us/research/research-papers/marriage-and-economic-well-being-the-economy-of-the-family-rises-or-falls-with-marriage/. Phillip Cohen, “Cohabitation and the Declining Marriage Premium for Men,” Work and Occupations 29, no. 3 (2002): 354. Sanders Korenman and David Neumark, “Does Marriage Really Make Men More Productive?” Journal of Human Resources 26, (1990): 282-307. Eng Seng Loh, “Productivity Differences and the Marriage Wage Premium for White Males,” Journal of Human Resources 31, (1996): 566-589. Leslie S. Stratton, “Examining the Wage Differential for Married and Cohabiting Men,” Economic Inquiry 40, (2002): 199-212. 12) Richard W. Johnson and Melissa M. Favreault, “Economic Status in Later Life among Women Who Raised Children Outside of Marriage,” Journal of Gerontology 59B, no. 6 (2004): S321. See also Pamela J. Smock, Wendy D. Manning, and Sanjiv Gupta, “The Effect of Marriage and Divorce on Women’s Economic Well-Being,” American Sociological Review 64, no. 6 (December 1999): 803. Steven L. Nock, “Marriage and Fatherhood in the Lives of African American Men,” in Black Fathers in Contemporary Society, ed. O. Clayton, R. Mincy, and D. Blankenhorn (New York: Russell Sage Foundation, 2003), 30-42. As cited in Institute for American Values, “Why Marriage Matters: 26 Conclusions from the Social Sciences,” 21. Available at http://www.americanvalues.org/pdfs/why_marriage_matters2.pdf. Accessed 1 August 2011. 14) Joseph Lupton and James P. Smith, “Marriage, Assets, and Savings,” Labor and Population Program, Working Paper Series 99-12 (November 1999): 33. 15) Joseph Lupton and James P. Smith, “Marriage, Assets, and Savings,” Labor and Population Program, Working Paper Series 99-12 (November 1999): 9. 16) Janet Wilmoth and Gregor Koso, “Does Marital History Matter? Marital Status and Wealth Outcomes among Preretirement Adults,” Journal of Marriage and Family 64, no. 1 (February 2002): 261. 17) Joseph Lupton and James P. Smith, “Marriage, Assets, and Savings,” Labor and Population Program, Working Paper Series 99-12 (November 1999): 20. 18) Julie Zissimopoulos, “Gain and Loss: Marriage and Wealth Changes over Time,” Michigan Retirement Research Center, Working Paper (January 2009): 7. 19) Jay L. Zagorsky, “Marriage and Divorce’s Impact on Wealth,” Journal of Sociology 41, no. 4 (2005): 415. 20) Julie Zissimopoulos, “Gain and Loss: Marriage and Wealth Changes over Time,” Michigan Retirement Research Center, Working Paper (Jan. 2009): 9. 21) Satomi Wakita, Vicki Schram Fitzsimmons, and Tim Futing Liao, “Wealth: Determinants of Savings Net Worth and Housing Net Worth of Pre-Retired Households,” Journal of Family and Economic Issues 21, no. 4 (December 2000): 412. 22) Maria Sophia Aguirre, “Determinants of Economic Growth, Population, and Family Wealth: The Case for Guatemala,” Centro de Investigación Familia, Desarrollo y Población (FADEP) (2007): 15, 59. 23) Julie Zissimopoulos, “Gain and Loss: Marriage and Wealth Changes over Time,” Michigan Retirement Research Center, Working Paper (January 2009): 9, 22. 25) J. P. Smith, “Marriage Assets and Savings,” RAND Corporation, 1994. 26) David P. Goldman, “Demographics and Depression,”First Things, May 2009. 27) The U.S. Census Bureau creates a set of poverty thresholds annually based on family composition and size, which must be worked with, despite its severe and justified critics. If a family’s pre-tax income (without capital gains or welfare benefits) falls below this threshold, then the family is in poverty. 28) Carmen DeNavas-Walt, Bernadette D. Proctor, and Jessica C. Smith, Income, Poverty, and Health Insurance Coverage in the United States: 2007, Current Population Reports, Series P60-235, “Table B-3: Poverty Status of Families by Type of Family: 1959 to 2007” (Washington, D.C.: Bureau of the Census, 2008). Available at http://www.census.gov/prod/2008pubs/p60-235.pdf, 2010. 29) Daphne Hernandez and Kathleen M. Ziol-Guest, “Income Volatility and Family Structure Patterns: Association with Stability and Change in Food Stamp Program Participation,” Journal of Family and Economic Issues 30, no. 4 (2009): 366. 30) W. Bradford Wilcox, Joseph Price, and Robert I. Lerman, “Strong Families, Prosperous States: Do Healthy Families Affect the Wealth of Nations?”, The American Enterprise Institute (2015), available at https://www.aei.org/wp-content/uploads/2015/10/IFS-HomeEconReport-2015-FinalWeb.pdf. 31) W. Bradford Wilcox, Joseph Price, and Robert I. Lerman, “Strong Families, Prosperous States: Do Healthy Families Affect the Wealth of Nations?”, The American Enterprise Institute (2015), available at https://www.aei.org/wp-content/uploads/2015/10/IFS-HomeEconReport-2015-FinalWeb.pdf. Thomas DeLeire and Leonard M. Lopoo, Family Structure and the Economic Mobility of Children, Economic Mobility Project, (2010). Available at http://www.economicmobility.org/assets/pdfs/Family_Structure.pdf. Accessed on 14 March 2011, 11. 32) Garnett Picot, Myles Zyblock, and Wendy Piper, “Why do Children Move Into and Out of Low Income: Changing Labour Market Conditions or Marriage or Divorce?” Statistics Canada, Analytical Studies Branch working paper (1999): 15. Timothy J. Biblarz and Adrian E. Raftery, “The Effects of Family Disruption on Social Mobility,” American Sociological Review 58, no. 1 (February 1993): 105. 33) Thomas DeLeire and Leonard M. Lopoo, Family Structure and the Economic Mobility of Children, Economic Mobility Project, (2010). Available from http://www.economicmobility.org/assets/pdfs/Family_Structure.pdf, Accessed on 14 March 2011, 11. 34) Patrick Fagan and Nicholas Zill, “Index of Family Belonging and Rejection: State by State,” The Marriage and Religion Research Institute (2015) available at http://marri.us/research/research-papers/index-of-belonging-and-rejection-state-by-state/. This entry draws heavily from Marriage and Economic Well Being: The Economy Rises or Falls with Marriage, The Family GDP: How Marriage and Fertility Drive the Economy, and How Broken Families Rob Children of their Chance for Future Prosperity.